Destiny’s Festival of the Lost is underway once more, bringing with it a heaping helping of masks, mirth, and microtransactions. Also, you can ride a broomstick. As with last year’s festival, you can get started by visiting Eva Levante in the tower or, this year, Tyra Karn in the Iron Temple. Eva’s quest is the usual deal—go around to all the characters in the tower and get candy, then return to her for a mask that starts a new quest where each step requires you to complete feats in the game while wearing masks. Tyra’s quest looks similar in structure, albeit with different steps and likely a different reward. So far the Destiny community has uncovered a couple of secrets, too. The first is related to the box of raisins that the perennial killjoy Eris Morn gives out instead of candy. If you trade those and some motes of light to the Speaker (per the Destiny subreddit) for “ascendant raisins,” you’ll start on a brief jaunt around the tower, trading your candy to NPCs for different candy. (If you kept your raisins from last year, which I truly hope you did, they will have already become ascendant and you can hop to the second step.) After the Speaker, go in order to: Zavala, Master Rahool, Amanda Holiday, Cayde-6, and finally back to Eris Morn. Trade whatever candy you’re holding to whatever candy they’re offering. …and a slightly wilted piece of celery. I’m guessing we’ll have to wait for Destiny 2 to find out what the celery does. The raisins thing is silly, but the second secret (also per DTG) is sillier: The Lost Broom sparrow. 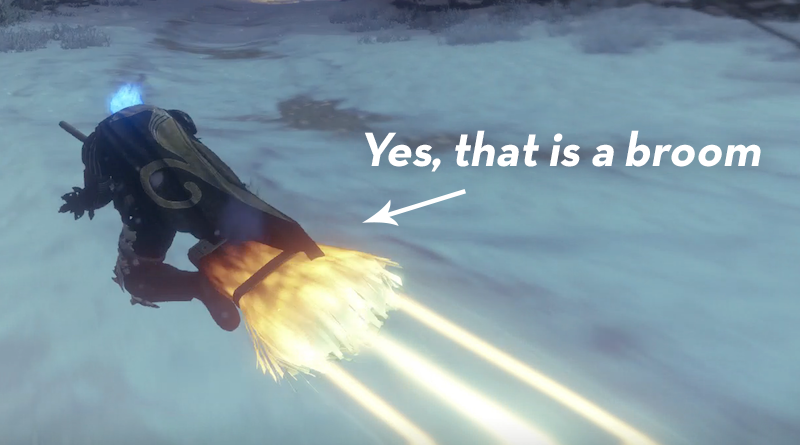 Equip it as your sparrow and you can ride around the Cosmodrome like Kiki. The broom can do a barrel roll in midair, and when you hold down the accelerator it doesn’t make the usual blasting sound—all you can hear is the wind in your ears. The Lost Broom will expire when the Festival of the Lost ends in a couple weeks, so enjoy it while you can. Given that the weekly Crucible playlist is Combined Arms (again! ha! yes! ), I hope to spend the week watching a bunch of broom-riding guardians running one another down.